The Empress multidrive allows you to blend Overdrive, Distortion and Fuzz together, creating a full and rich array of tones that would not be available otherwise. Let the sustain of fuzz, the bite of distortion and the clarity and note definition of overdrive all work together! It’s like having an overdrive pedal, a fuzz pedal, and a distortion pedal, all in one box. All Analog Signal Path – innovative analog signal path which harnesses the best characteristics of germanium diodes, class-a BJT amplifiers, FET distortion and soft led clipping curves to deliver amp-like tones. Ultimate Control – independent control over the amount of fuzz, distortion and overdrive that gets added in parallel to create the final sound. Each can have a high pass or low pass filter engaged. 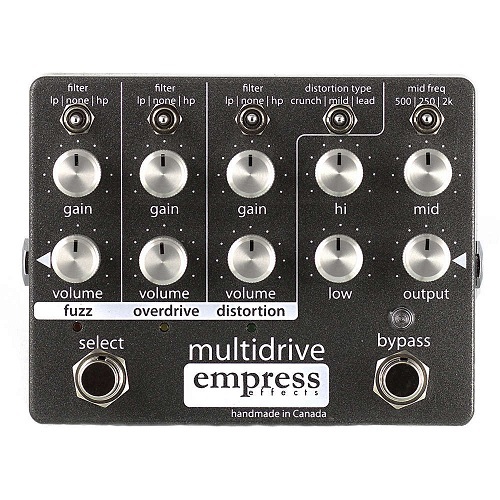 Incredible Value – The Empress Multidrive is three pedals in one! Classic Fuzz – great fuzz sound which allows for smooth, rich sustain and great note definition. Vintage Overdrive – Unique overdrive circuit which has athe smooth germanium break-up and the compressed characteristics of a tube amp. Bass – Works great on bass! It’s easy to blend a distorted top end with a crystal clean low end to get an aggressive vibe with punchy and dynamic lows. Comprehensive EQ – Smooth sounding high and low shelving EQ combined with a powerful frequency selectable mid band bell. True Bypass – The Empress Mmultidrive employs true bypass, so you can be sure that it’s not affecting the signal when disengaged. True Display LEDs – Bright multi-color LEDs always let you know what the Multidrive is doing. Voltage: 180mA 4.5" x 1.5" x 3.5"
Dimensions: 4.5" x 1.5" x 3.5"